April 18, 2017. The Wheatleys have advised that they have sold Tiare to David Eva. We are standing by for David to check in. We sold Tiare to David Eva last September. I believe he has taken her to Tacoma, WA. He is familiar with the Dolphin 24 website, but, I note he has not yet made contact with the site to provide his information. Thanks for all the effort you put into maintaining the Dolphin 24 website. The knowledge of the design and its history added to our pleasure in owning Tiare. December 20, 2010. Sharon and Dale Wheatley have checked in as the new owners of Tiare. Here is their email. 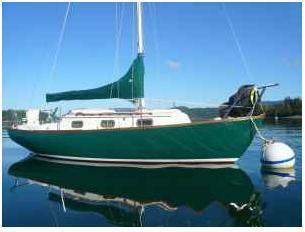 My wife, Sharon, and I purchased Pacific Dolphin Hull #267 from Jeff Gable today. The boat is remaining in The San Juan Islands, but, with a new home port of Fisherman Bay on Lopez Island. This is our first boat, although we did some sailing on J22s in Colorado as members of a sailing club. We are looking forward to exploring the San Juan and Gulf Islands in our new Dolphin. Thanks for putting this site together - we found our new boat through the roster discussion of a boat for sale on Shaw Island. We don't know much about #267's history. The above picture was sent in by former owner, Jeff Gables, and we'll use it here until the Wheatleys update with their photos. December 21, 2010. Dave sent in the following update on Tiare's history. Tiare's previous owner, Jeff Gable of Shaw Island, WA, applied for title to the boat 9/02/09 in San Juan County. Jeff mentioned that the boat's previous owner also has a residence on Shaw Island, although I think at the time the boat was purchased in 1997 he lived in Friday Harbor on San Juan Island. Jeff had a copy of the previous owner's pre-purchase survey that he gave me with the boat. The survey was performed by E.C. Comings, Jr. of Anacortes, WA on 5/5/97 for purchaser Frank Chaffee. The seller of the boat's last name is listed on the survey - Raulerson. The boat was stored on the hard in Anacortes. The boat's name - Tiare is listed on the 1997 survey. The survey finds "This vessel is exceptionally well maintained both inside and out. It has been sitting for some period of time and needs some cosmetic attention at this time. In our opinion the vessel is a good risk. The vessel appears to meet ABYC, NFPA and CG standards/regulations. The vessel is well found and appears to be capable of operating in inland and coastal waters." The survey listed the five sails in the boat as "new" (in 1997). It also listed the boat's propane 2 burner stove and porta-potty as "new". The rigging is listed as new/overhauled in 1996. Tiare does have it's Pacific Dolphin/Sparkman & Stephens brass tag mounted on the bulkhead confirming the hull number is 267. The cabin also has the requisite weathered brass oil lamp mounted to the port side of the bulkhead. Tiare's HIN is PDM22671076. Thought this might help others identify their hull number. Hope you and your family have a wonderful Holiday - ours is starting off fantastic. June 25, 2013. Dale sent in a note advising of a Dolphin For Sale on CraigsList, and a short update on Tiare. I sailed Tiare down to Des Moines, WA from Lopez Island. (Well, one day of sailing and a day and a half of motoring.) She is now in the Des Moines Marina. We have only made a few short day trips with her in the Des Moines to Tacoma stretch of Puget Sound. No sailing at all yet this year! Here is how we 'found' Tiare. DFI Mark Steinhilber (Rascal) emailed us on October 23, 2010 that there was a Pacific Dolphin For Sale on Seattle CraigsList. The ad appears below. We contacted the owner, Jeff Gables, and he sent in some pictures and the following emails. 246? We had thought that #246 was possibly the last Yankee built, but maybe she is the first Pacific Dolphin? (And, adding to the confusion Yankee # 248 has since checked in??) Hopefully Jeff can straighten this out. And he did. I went out to the boat today and I gave you the wrong number. I am hull# 267. I have a plaque on the bulkhead S&S Pacific Dolphin. I use to have a Pearson Vanguard and that (246) was the number of that boat. My boat was named Tiare a Tahitian flower? but it was painted on in a way that was pretty awful and took up the whole transom. If I come to my senses and keep the boat she will be the "Swallow"
Tiare/Swallow, Pacific Dolphin, #267 is a newly found Dolphin, the 166th. Click here to go that list. This is the CraigsList ad - updated link December 13, 2010.